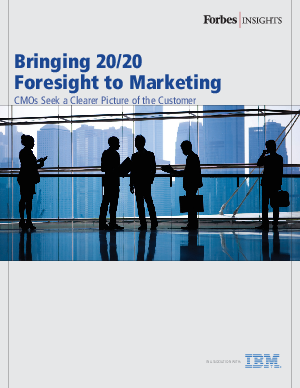 Bringing 20/20 Foresight to Marketing is based on an exclusive survey of more than 300 marketing and senior-level executives at large companies ($250M-plus in revenues) in the U.S. and the U.K. Survey respondents were asked about their efforts to meet business goals using online marketing software to manage their programs. The findings provide a glimpse into a fast-paced future fueled by robust and far-reaching analytics data used to manage and enhance the customer experience. In addition, the study reveals how top performers-those businesses that rate their marketing technology investment as a world-class differentiator-take a more proactive and agile approach to marketing. For example, these world-class marketers are three times as likely to track their campaign performance in real time, and more than four times as likely to adjust their campaigns in real time.